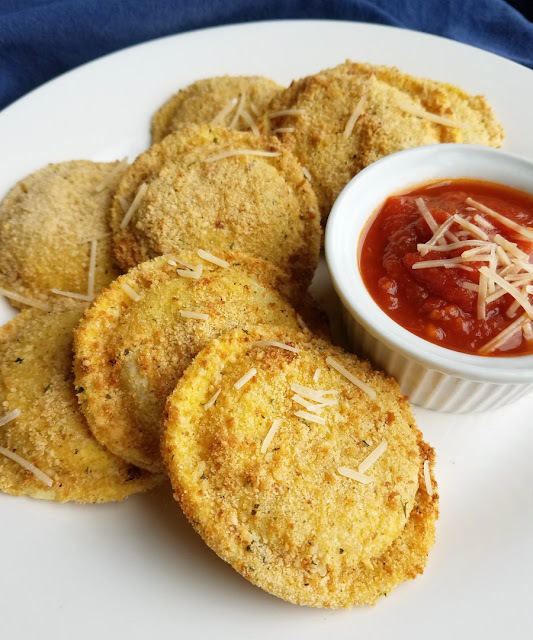 Make golden and crispy toasted ravioli quick and easily in your air fryer! This St. Louis classic appetizer is perfect for parties, game day or just because! 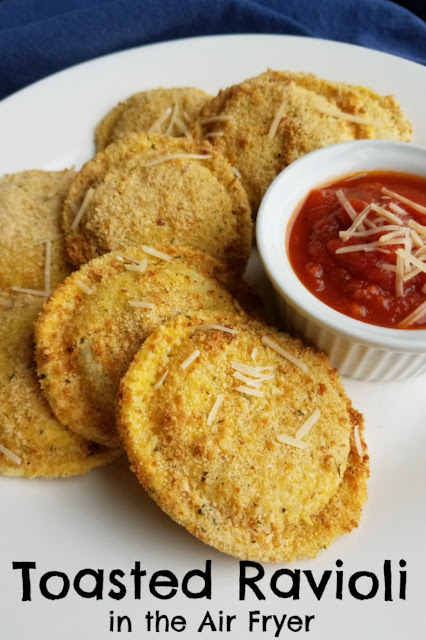 Have you ever had toasted ravioli? They are a classic in the St. Louis area, so naturally being located so close we are familiar with them as well. Get those golden crispy appetizers at home without the mess or smell of frying. Make them in an air fryer instead! Now that it's cold out, we have been trying to get back to watching a game or two on Sundays. It's nice to kick our feet up, watch some football and do a little snacking. Often that means I make a huge pot of chili and a snack or two. Then we watch the games and munch as we feel like it. We also love to have people come watch the game with us. It's fun to catch up, talk smack and have the excuse to make more snacks! When Hamilton Beach sent me an air fryer, I knew it would be used for plenty of game day treats. The only problem was deciding what to make first. We have actually tried a number if fun things already with great success. A bag of frozen onion rings have never tasted so good as those we did in the air fryer. They were crispy, golden and delicious! But those don't hold a candle to these toasted ravioli. These puppies were easy to make and oh so good. Just get a container of your favorite fresh or frozen (and defrosted) ravioli and you are ready to rock. Cheese or meat fillings are most popular, but any would be amazing. From there all it takes is a dip in the egg wash and a coating of seasoned breadcrumbs and Parmesan cheese. A few minutes in the air fryer and toasty goodness is born! We love dipping ours in a bit of marinara for a fabulous appetizer. However we love them so much, we could easily make a meal out of them. Yum! I already have another air fryer recipe or two up my sleeve. I hope to share them with you once we get through all of the Christmas recipes. Do you have an air fryer? What are your favorite things to make? Make smaller versions of these buffalo chicken taquitos in your air fryer! Pulled pork nachos are always a great choice. Cookies and cream football cheese ball is a cute and sweet finish to your game day spread. In a small bowl, beat together egg and water. Set aside. In another small bowl, mix together the bread crumbs and Parmesan cheese. Dip the fresh or defrosted ravioli in the egg wash then in the bread crumbs and cheese. Make sure the entire surface is covered. If desired spray the surface of the raviolis with cooking spray. Place a few ravioli at a time into the air fryer basket. You don't want a ton of overlap if you can avoid it. Cook at 400 F for 4-6 minutes or until golden brown. Serve with marinara and additional cheese if desired. * If you don't have Italian breadcrumbs, use panko or plain bread crumbs and mix in a teaspoon or so of Italian seasoning. The Hamilton Beach Air Fryer would make a great gift for anyone that loves to cook and entertain! This holiday season, don't forget to shop through Ebates so you earn cash back on all your purchases! we do too, these are going to be a regular occurrence around here! I would totally make some wings!! We love wings in this house and I would make a HUGE batch. Wings are on my short list too! 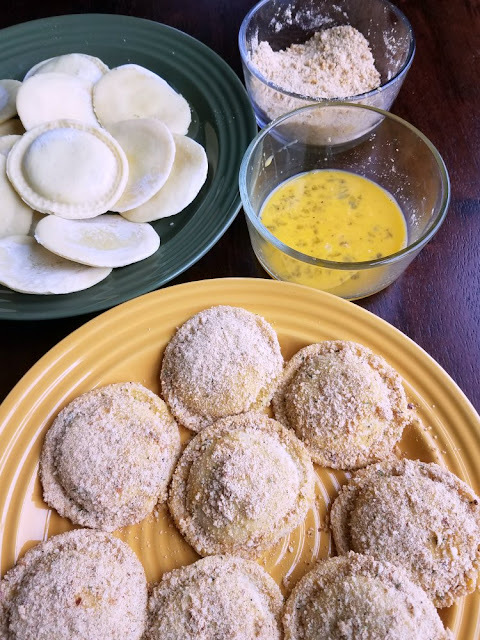 Toasted ravioli are popular in the Buffalo, NY area too and I like the idea of using an air fryer... I've yet to try one! I could see you an air fryer when hosting friends for watching football and basketball games this winter. It's a great way to make game day treats without the grease! I'd definitely start out with those toasted ravioli, then move on to some jalapeno poppers. All the food I used to love deep fried that I could now make in a more healthy way! Poppers sound amazing, I need to make some asap! 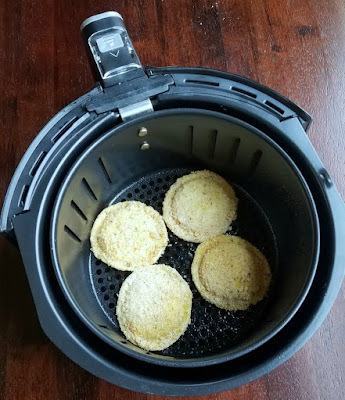 I have an air fryer and LOVE it! I will have to make these raviolis! I would make donuts! I never make them at home because of all the oil and greasiness, but I would totally try it on an air fryer! 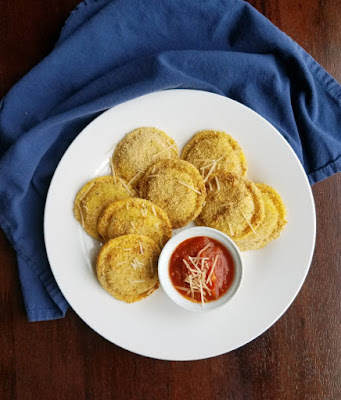 It's been ages since I've made toasted ravioli but now I want to make them again - but in an air fryer to make them a bit healthier! It's a perfect way to make them! I love fried ravioli! So delish! I have not used an air fryer yet! Fingers crossed ;)! I did sweet potato fries too, yum! I made a batch of them too, yum! I want to win the air fryer and make your toasted ravioli! The possibilities are endless! I think I'd make shrimp croquettes first, though. I would love to try making the fried ravioli! Looks amazing! 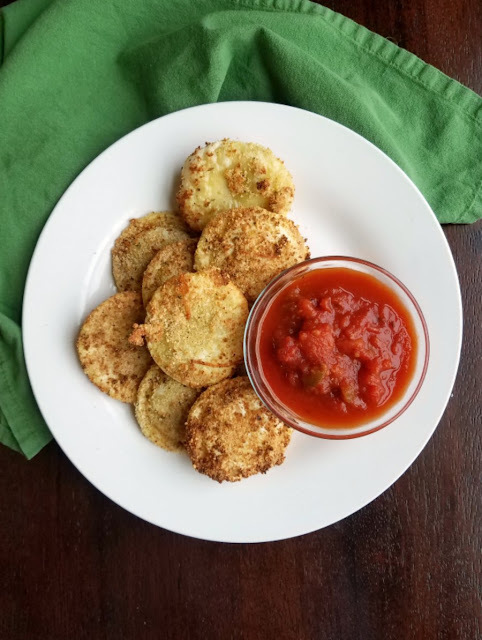 Your toasted ravioli is the only air fryer recipe I know, so this would be the first thing I would try! What I would make first if I won is your toasted ravioli recipe. It sounds delicious!!! I would make these toasted ravioli. Your recipe looks amazing! I just love crunchy pasta, this looks yummy! Hope you are enjoying your week and thanks so much for sharing with us at Full Plate Thursday! I am making that toasted ravioli, for sure. They look delicious!! Great idea! I hope you love them!